I have just returned from an incredible trip to the amazing region of LaChampagne in France followed by 5 wonderful days in beautiful, sunny Paris. While I often get asked about a day trip to Reims from Paris (just one hour by train) to visit a champagne cellar, never have I been asked to design an itinerary around a week or so in this spectacular region totally void of tourists. 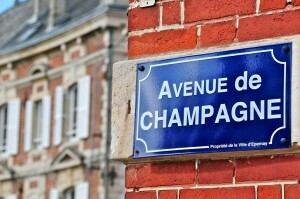 If you have plans to return to France and enjoy a glass of bubbly, this region should be high on your list. With the 3 beautiful cities of Reims, Epernay and Troyes anchoring the area, miles and miles of scenic vineyards and countless, gorgeous stone villages interspersed, there is enough to see and do to keep you busy for days or even weeks. We even squeezed in a visit to Renoir’s House and Studio in Essoyes. Between our educational talks at the International Wine Tourism Conference, and the many visits to world-famous champagne houses such as Veuve Clicquot, Taittinger, Collet and Mercier along with several visits to small independent wineries producing amazing champagnes – some selling for just 15 Euros a bottle – we learned a wealth of facts and figures about this fabulous product. During our stay there, we sampled champagnes paired with all kinds of foods … with the exception of a very rare table wine called Rose de Riceys produced from only certain pinot noir grapes in one small village, the bubbly was served exclusively at every meal. Usually 5 different varieties with 5 different courses. Only very few producers make Rosé des Riceys wines, and in limited quantities, so they are very rarely seen outside France. Stretching from Reims in Marne due east of Paris south to the Aube and the border of Bourgnone (Burgundy), La Champagne covers a large and beautiful area of France that should definitely be on your must-see list!! With the help of all my new found friends in the area, we can design a fantastic itinerary for you! Following my week in LaChampagne, I traveled by train into Paris where I took time to explore in depth the areas of St. Germain de Pres and the Marais as well as visit some of the lesser known museums, such as the Musee de Cluny, L’Orangerie, and Musee Rodin which were all small and amazing. A visit to Monet’s house and Gardens in Giverny rewarded us with a blaze of color thanks to the incredibly warm weather. Finally a return to the summit of the Eiffel Tower after 45 years! Here despite having the required timed ticket entry, the lines for the elevators to reach the summit took over an hour … and then there are the lines to get down again. BUT I have discovered the secret sauce … how to get up the Eiffel Tower without waiting in the elevator lines! Ask me how for your next trip to Paris. Stays in two of my favorite Left Bank Hotels, Relais Christine and L’Espirit St. Germain just made our visit very special. Definitely missing my glass of champagne today ……. We are so excited that our favorite River Cruise company will FINALLY have a fabulous new ship on the magnificent Douro River. This is one of the most scenic and wonderful experiences you will ever have. Also the new Seine itinerary in France is super wonderful! Call us now before they all sell out! Paris & NormandyCruise the Seine River on board the beautiful AmaLegro, part of AmaWaterways Sensational Six. AmaWaterways Sensational Six are custom-designed, premium vessels carrying up to 150 passengers and introduce a new standard of River Cruising on the great waterways of Europe. Your journey takes you from Paris to Paris through the heart of Normandy, exploring the beautiful countryside that inspired many famous painters, including Monet and Van Gogh. Visit Giverny, Rouen and Les Andelys, as well as the famous Normandy beaches before returning to Paris, the “City of Lights.” Book this itinerary and receive a complimentary 2-night stay in Paris. The Douro River ValleyDiscover the rich history of Portugal and Spain as you journey through the Douro River Valley, a UNESCO World Heritage Site, onboard the brand new AmaVida. This grand 108-passenger vessel features balconies in most of its staterooms and suites. Receive a complimentary 3-night stay in Lisbon when booking the Enticing Douro or the Port Wine & Flamenco itineraries. Highlights include visits to Porto, Salamanca, Régua and dinner at the Alpendurada Monastery. Book Now – Limited Time Offer! For families and friends this is a fantastic vacation option……. The charming old towns and villages of Western Europe are linked by a vast chain of water – rivers and canals that flow from bustling cities to quaint hamlets, passing through tranquil yet breathtaking landscapes. Set out to discover this intimate side of Europe on board two new comfortable barges for a leisurely, all-inclusive vacation – a great value in today’s European travel market. Save Now on Two New Cruise Itineraries for 2012: Call us for more details – we just love barging…. Cruise aboard ‘Panache’ through the German-influenced French region of Alsace-Lorraine. Find time to relax in the on-deck hot tub while you take in the incredible scenery. Reserve by May 31 and save $1,000 per cabin on hotel sailings or 10% on charter sailings from June 17-October 28. Enjoy the ever-changing scenery of the Canal de Bourgogne in the Burgundy region of France, passing vineyard-clad hillsides and quaint villages along the way. Dine on gourmet cuisine on board and save 10% per person on May hotel sailings or 20% on any 2012 charter sailing when you reserve by May 31. New Year is an event celebrated the world over as people gather together full of hope for the year to come. With such expectation, it can often be difficult to decide how to see in the New Year, but we have the perfect solution to your dilemma. Why not take advantage of a truly worldwide event and make this year the year to experience something different, somewhere different. In Europe we like to welcome the New Year in style with street parties, dinners, fiestas and balls taking place across the continent and dazzling firework displays illuminating the skies at midnight. Among the exuberance and festivities, Europe boasts some quirky and unusual traditions sure to bring you luck and good fortune, or an evening of entertainment at least. We have depicted a few of the more popular traditions below. Come and revel in the European atmosphere this New Year, learn more about our fascinating rituals, and maybe even take part in a few customs yourself. Book a minimum 5-night tour anywhere in Europe this New Year and receive a free day’s sightseeing with one of our hand-picked, local guides who, with their unrivaled local expertise, can take you on an insightful journey into the culture of your chosen location. To give you more inspiration we have put together six very special itineraries incorporating the highlights and spectacular New Year festivities of London, Edinburgh, Paris, Berlin, Madrid, and St Petersburg, guaranteeing you a celebration to remember. Book now to avoid disappointment as these events are very popular and tickets are likely to sell out soon. CALL US FOR MORE DETAILS ON THESE EXTRAORDINARY EXPERIENCES! New Year’s Eve, known as “la Saint-Sylvestre” in France, is celebrated with “le Réveillon de la Saint-Sylvestre”, a special feast with family and friends thought to bring good luck. Signature dishes include pancakes, foie gras and champagne. Bleigiessen is a popular tradition in Germany and involves the telling of fortunes.The unusual ritual involves dropping molten lead into cold water and the shape it forms is used to predict the person’s future. New Year trees are popular in Russia. Known as Novogodnaya Yolka, these are decorated like a Christmas tree. Russians say farewell to the old year by remembering the most important events of the last 12 months and making a wish for the New Year. Home to the lively Hogmanay, Scotland upholds a number of unusual traditions. Auld Lang Syne, directly translated as “times gone by”, is an old Scottish song, first published by the poet Robert Burns. The song is now sung at midnight while everybody links arms. First footing is a custom in which the first male visitor to enter a house on New Year’s Day brings with him coal, whisky, or perhaps shortbread, as a symbol of good luck. However, a blonde or red head is not allowed to enter first. In Spain it is traditional to eat twelve grapes, one on each chime of the clock at midnight. It is thought the tradition dates back to 1909 when grape growers suggested it as a way to cut down on surplus production from the year. “La Festa di San Silvestro” in Italy is often celebrated with a meal. Lentils are thought to symbolise money and good fortune while pork symbolises the richness of life in the forthcoming year. Wearing red underwear is also thought to bring good luck! LET US HELP YOU ARRANGE ONE OF THESE HOLDAY SPECIALS SO YOU CAN CELEBRATE IN STYLE! Enjoy a special feast and daily activities this Thanksgiving. Spend 4 magical nights at Cristallo this holiday season. Don’t miss this opportunity to bring the family along! Spend an enchanting Christmas and New Year in the City of Lights. Have a grand adventure with the World’s Best. Spoil yourself this holiday season at The Legian. Enjoy the holiday sparkle of New York City this season. JUST LOOK AT THESE AMAZING PRICES FROM A&K FOR INCREDIBLE LUXURY VACATIONS IN FABULOUS PLACES ALL OVER THE WORLD!! DON’T MISS THIS OPPORTUNITY. Subject to availability. All prices are per person based on double occupancy. Not combinable with any other promotion or discount. CALL IANNAZZI ENTERPRISES TODAY FOR MORE INFORMATION ON THESE INCREDIBLE OFFERS.